For the Restaurant, the food is local and international food, all cooked fresh. Prices are very reasonable, a little higher than the warungs but the portions are larger and the restaurant itself is beautiful and intimate. You can also prebook your favourite table. Hi, there are some fabulous walks in the area which is known for it's beauty. Its just like the old Bali of many years ago before lots of tourists, really special! 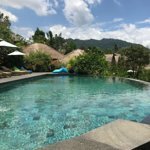 There are many different private tours from Samanvaya all with the staff who are all local, village tours where you can also go to the guides home in the community which is really interesting and personal, market tour or ricefield trekking as well as car tours and mount agung/batur treks. The most popular tour is a scooter tour which is just amazing! You don't have to drive, you go on the back as passenger. It lasts 2 or 3 hrs and you get to see places that you would never see in a car or walking. They are very good experienced drivers and the roads/tracks are very quiet so you feel safe. Very special indeed and very highly recommended as it is a unique experience. Don't worry, the staff at Samanvaya will look after you and if you want, you can contact them beforehand and pre book any activities you would like to do. Have fun! 3 nights are perfect - if you want to hire a guide from home, let me know and i Can give you the e-mail for our guide that we used for 7 days.Costs approx 45euros for a full Day - he knows all the temples and sights and has very good English skills. 3 nights is perfect - yes there are plenty of easy walks to do and it is possible to get a guide from the hotel - reasonably priced and well worth it - we had a great few hours with ours - beautiful walk in the ruice fields and very knowledgable. prices at restaurant and bar are very reasonable and there are other small hotels with restaurants attached equally well priced. samanvaya is a special place and the staff are fantastic - you will love your stay there.